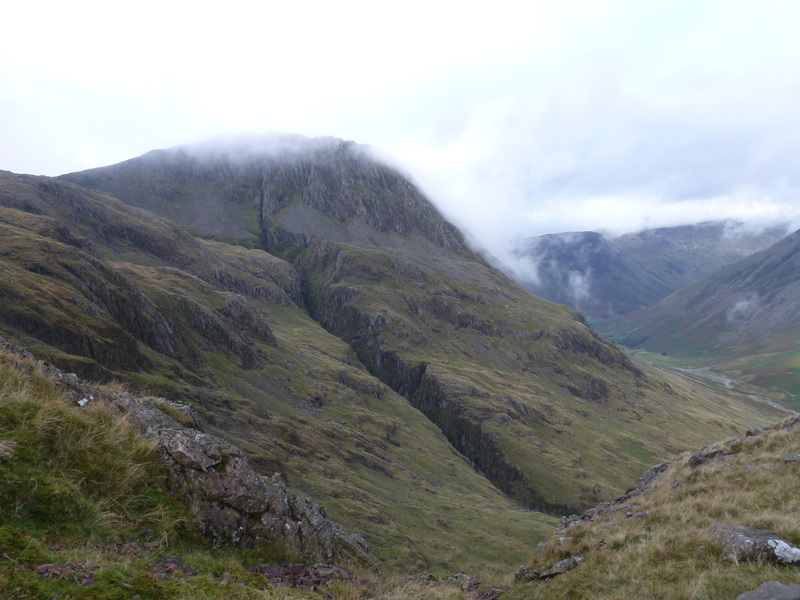 This was our second time up on Lingmell having had a thoroughly wet and miserable climb up from Wasdale a few years ago. 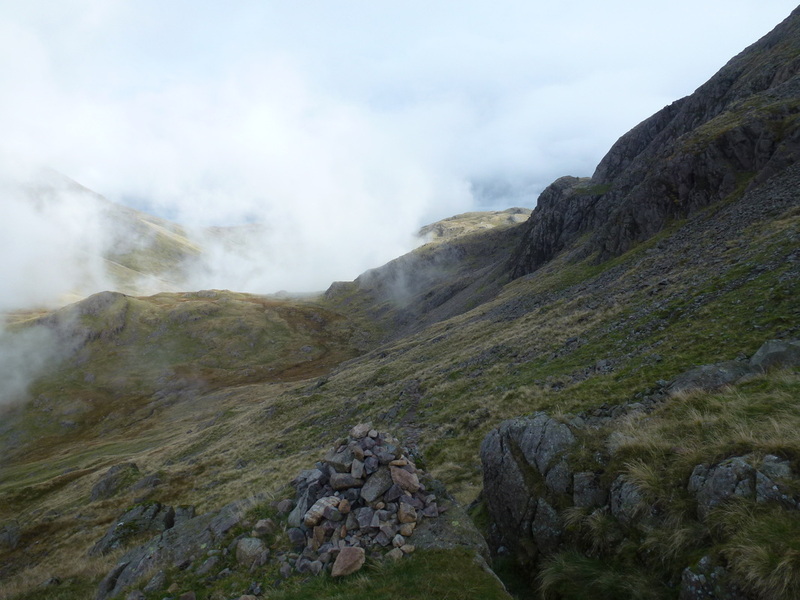 The weather did not look too bad today but time would tell. 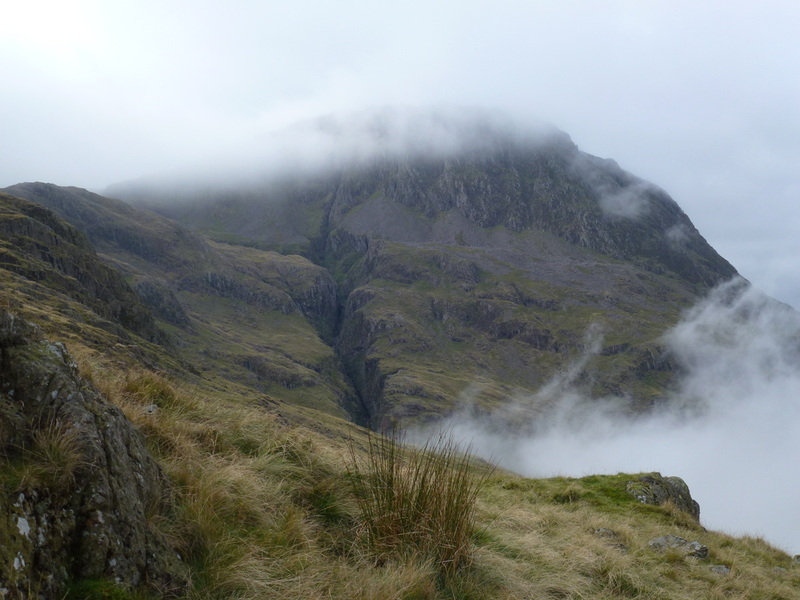 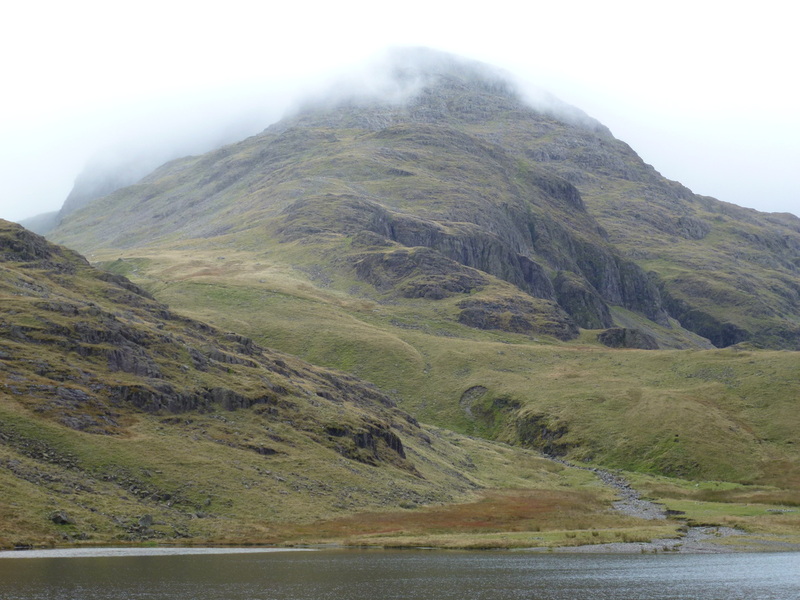 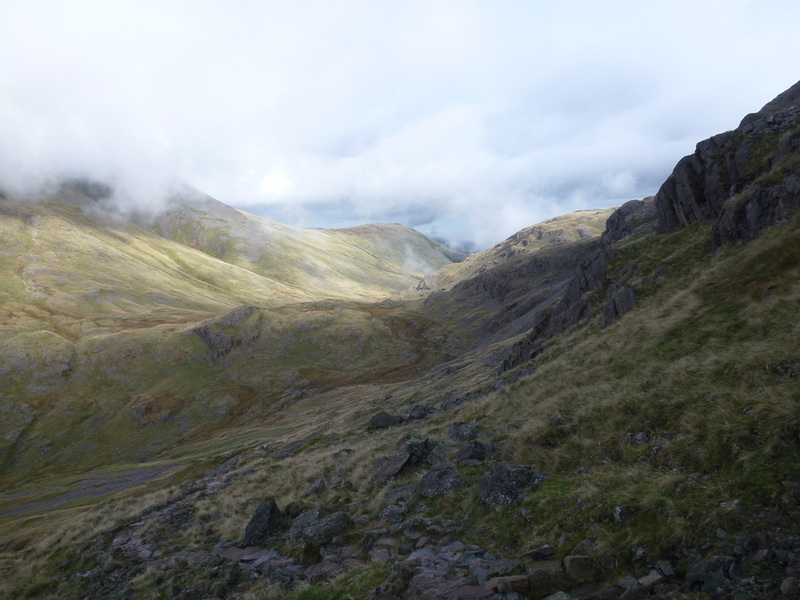 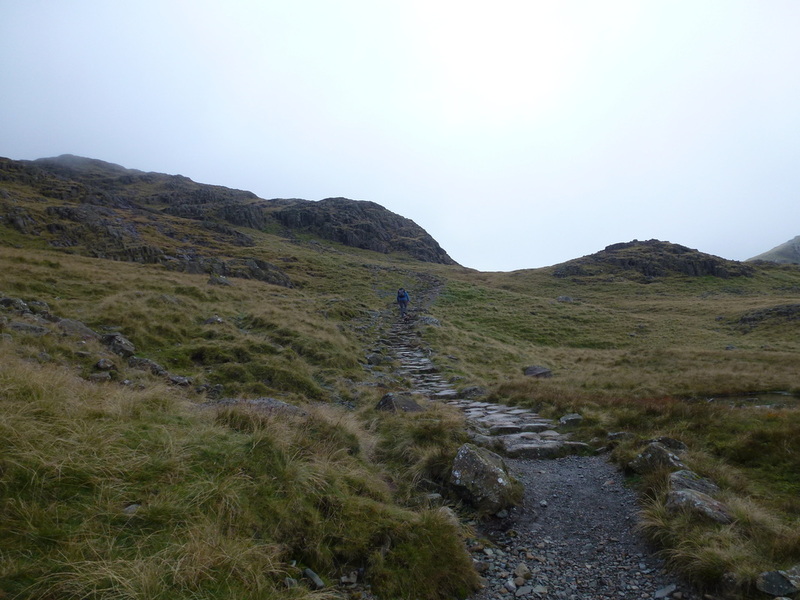 We had intended to ascend via Piers Gill but on arriving at the start in Seathwaite, decided to leave that ascent for another day as the higher ground was covered in low cloud. 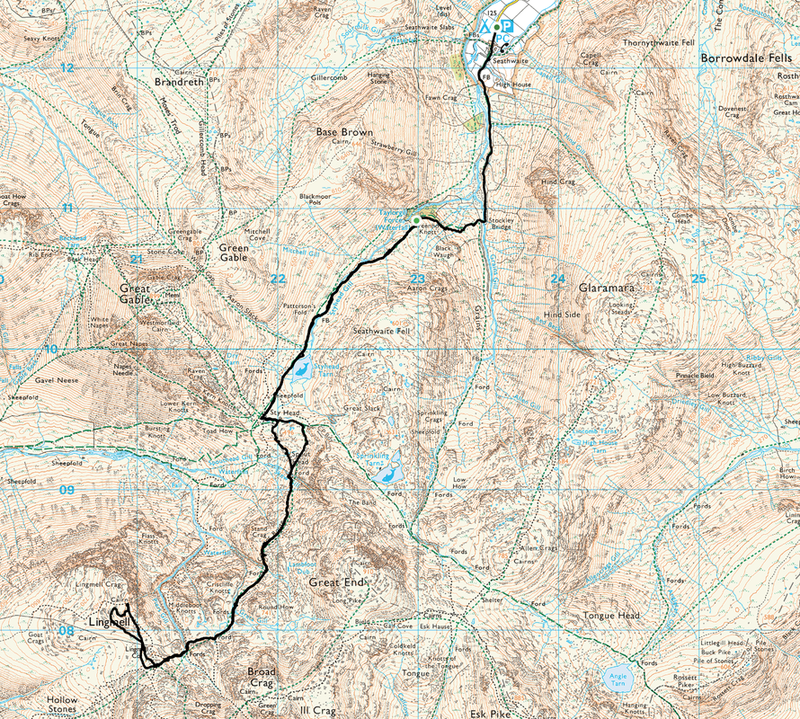 It was therefore decided to play it safe and instead opt for an out and back via the Corridor Route. 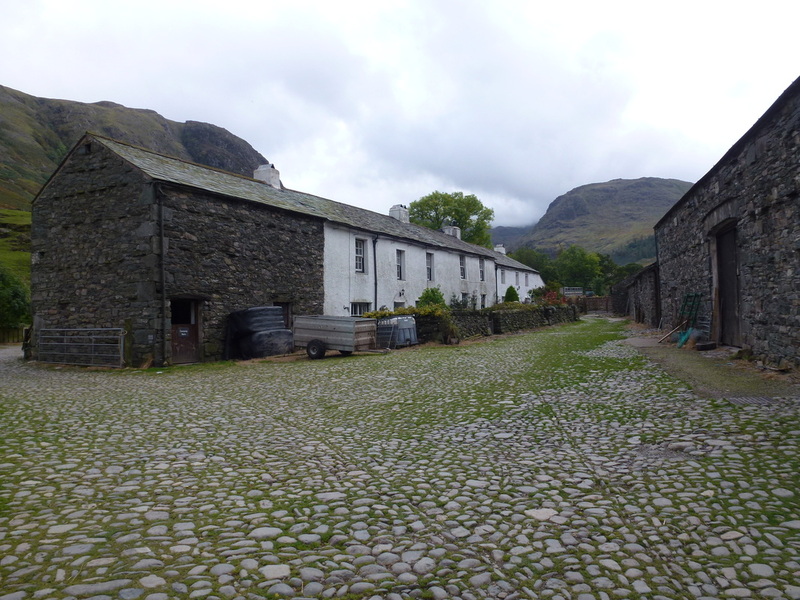 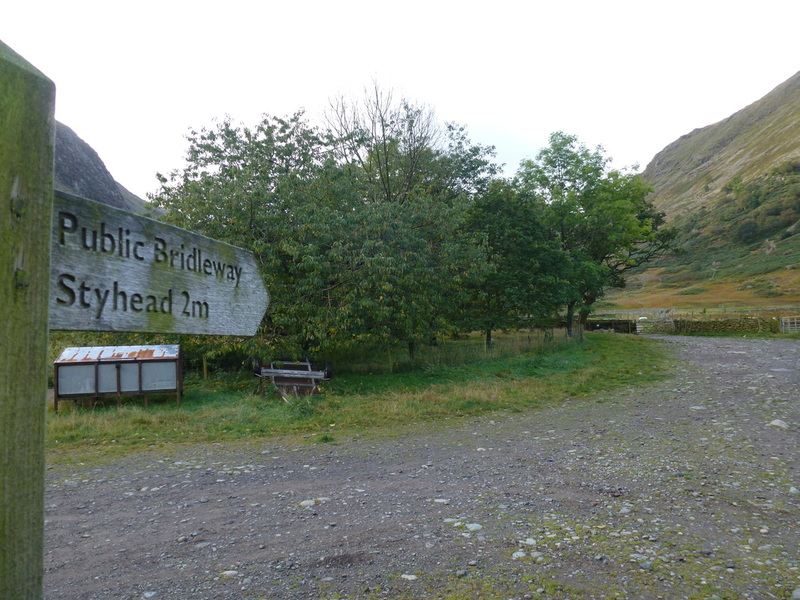 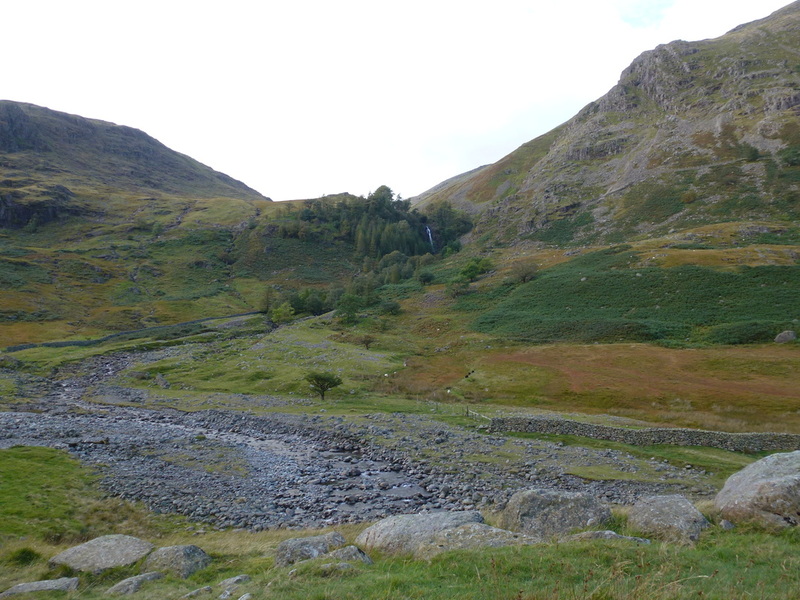 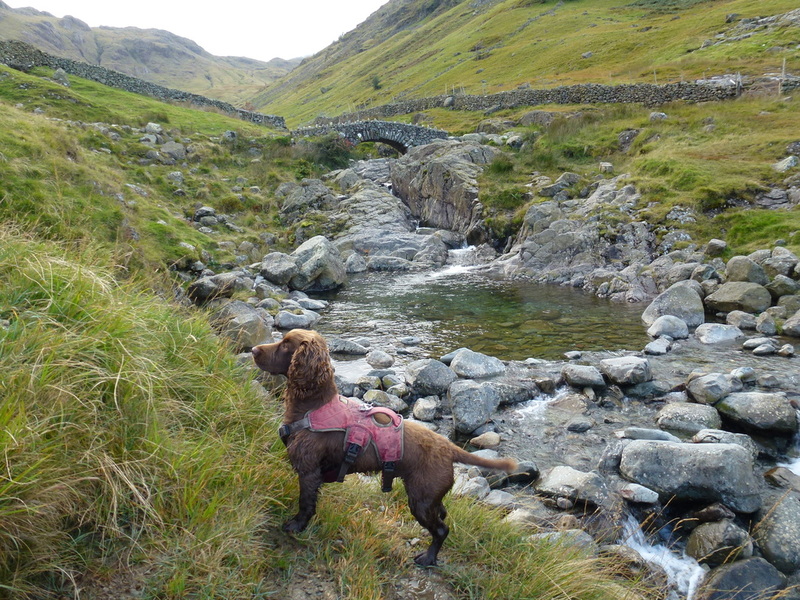 Leaving Seathwaite Farm, we headed out on the regular and well used route to Stockley Bridge. 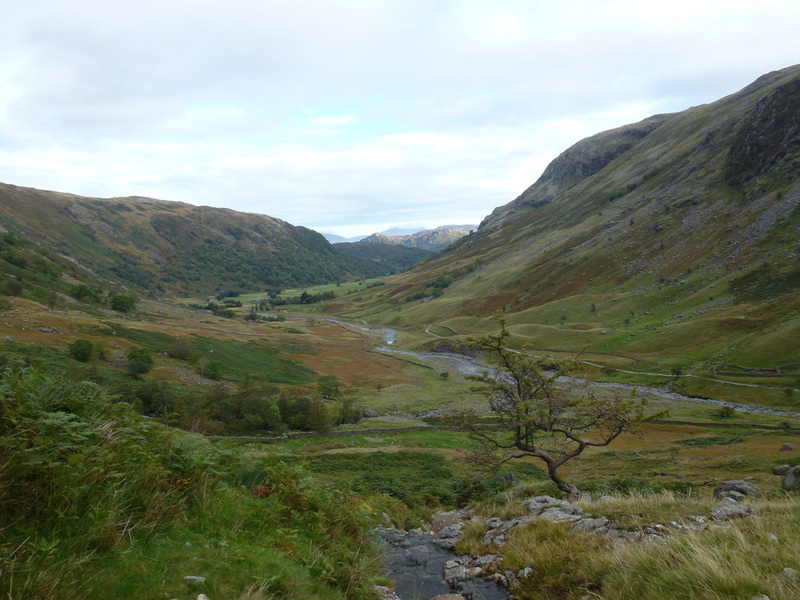 From the bridge, instead of heading straight up Grains Gill, we turned to the right and climbed steeply up towards Taylorgill Force and to the west of Seathwaite Fell where the path levels out to follow Styhead Gill and eventually reach Styhead Tarn. 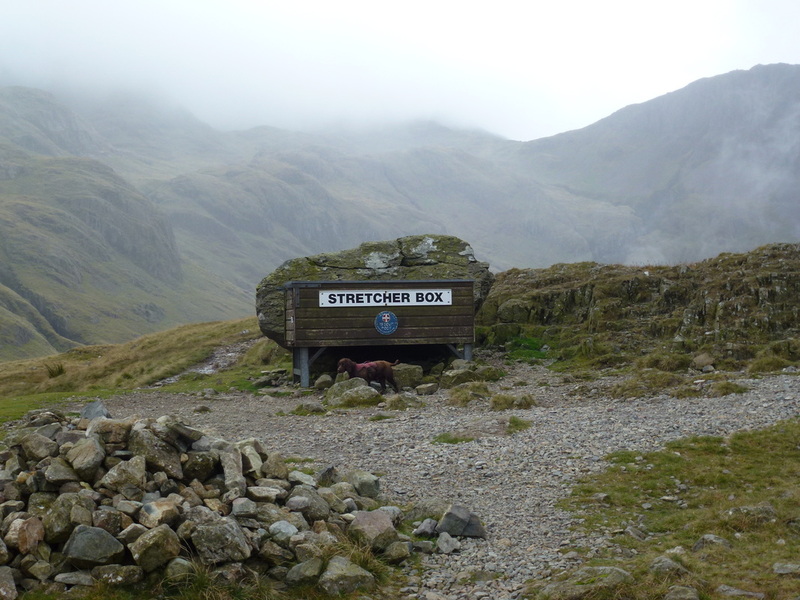 At the Mountain Rescue Stretcher Box there are a myriad of paths going off in all directions therefore it is worth taking a breather here and making sure you are going off in the right direction. 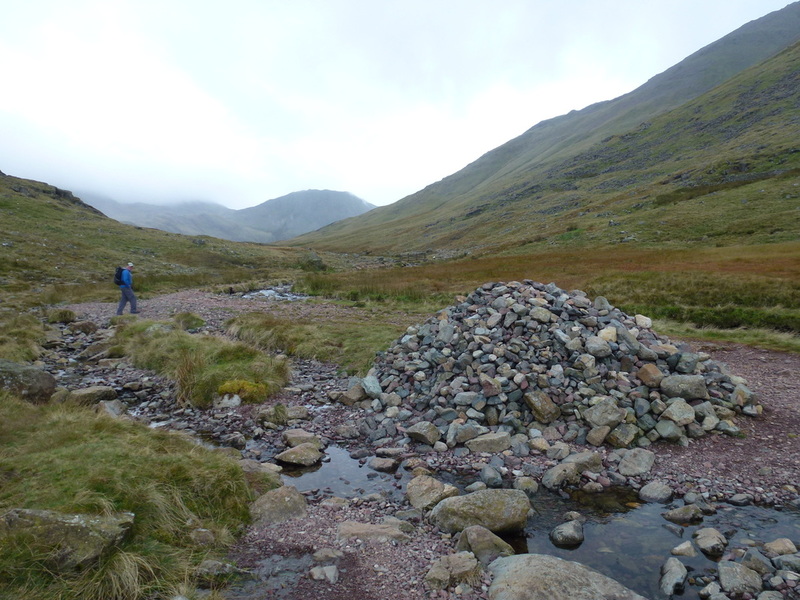 From Sty Head we first headed east before leaving to the south to join the Corridor Route at a small cairn - this is easily missed. 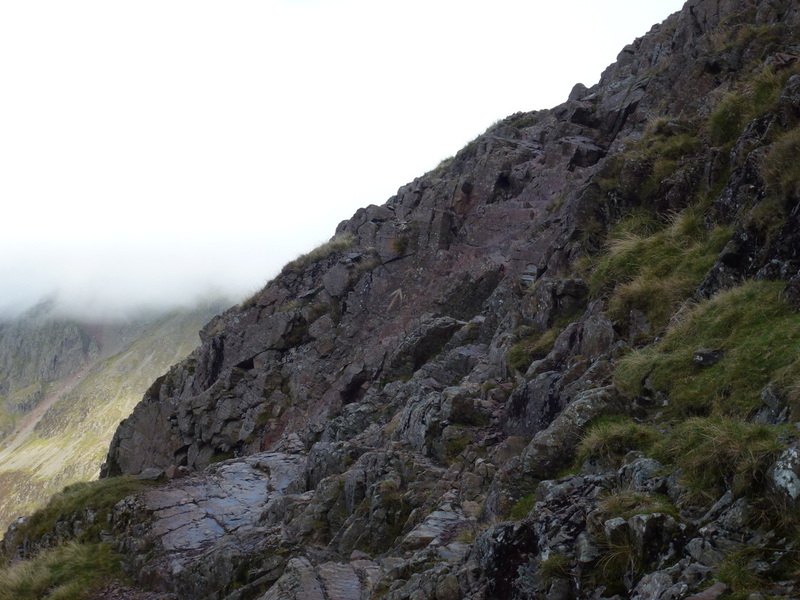 There now began a long but delightful climb on a good path - there were some steep sections and a tricky downward scramble near Stand Crag but on the whole the route up this popular path to Scafell Pike is easy enough. 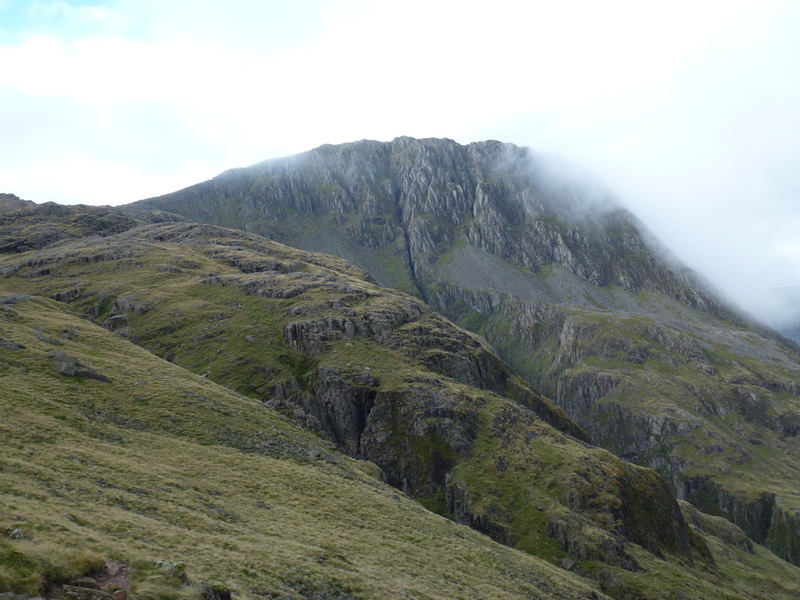 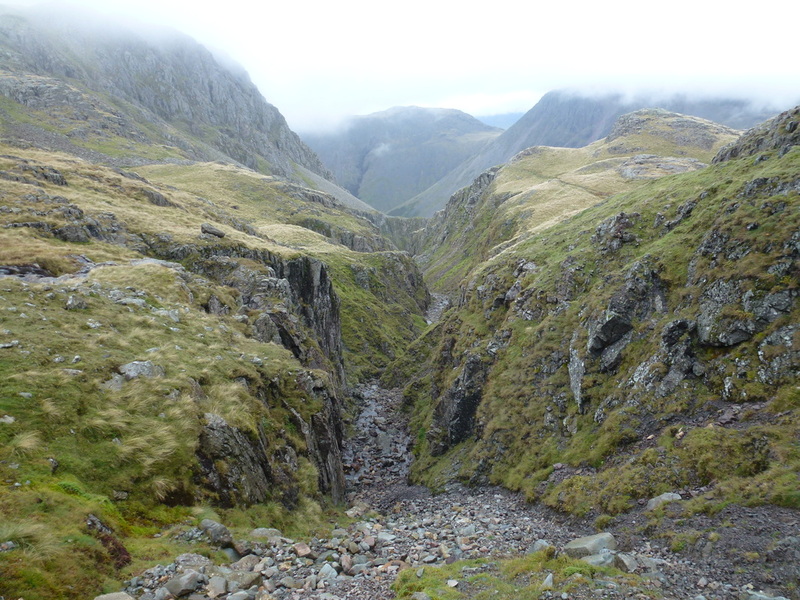 Once through the tricky scramble the path steepened to reach the head of Piers Gill which it crossed before climbing again to arrive at Lingmell Col - a meeting place for the paths coming up to Scafell Pike from Wasdale. 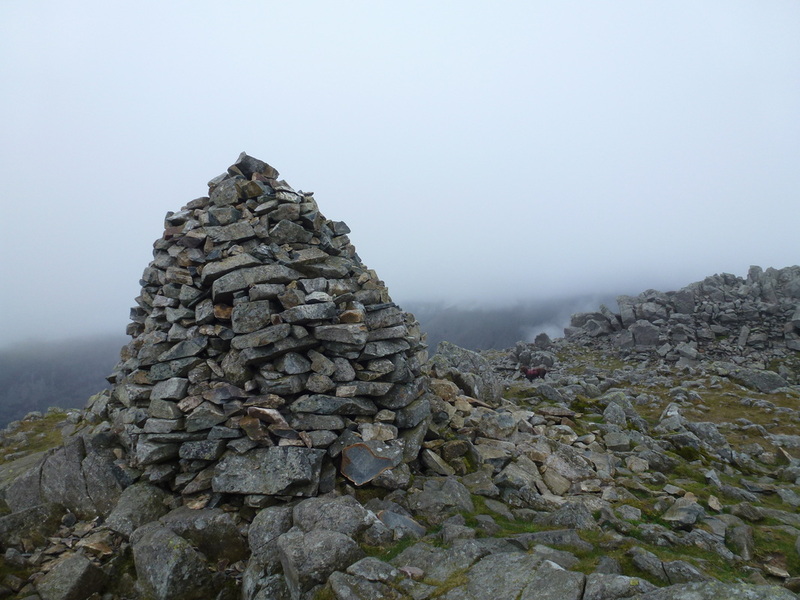 From the col we left the crowds heading for the Pike and continued north west to climb gradually to reach the large cairn on the summit of Lingmell - just like the last time we were here there were no views of note, just a thick grey soup. 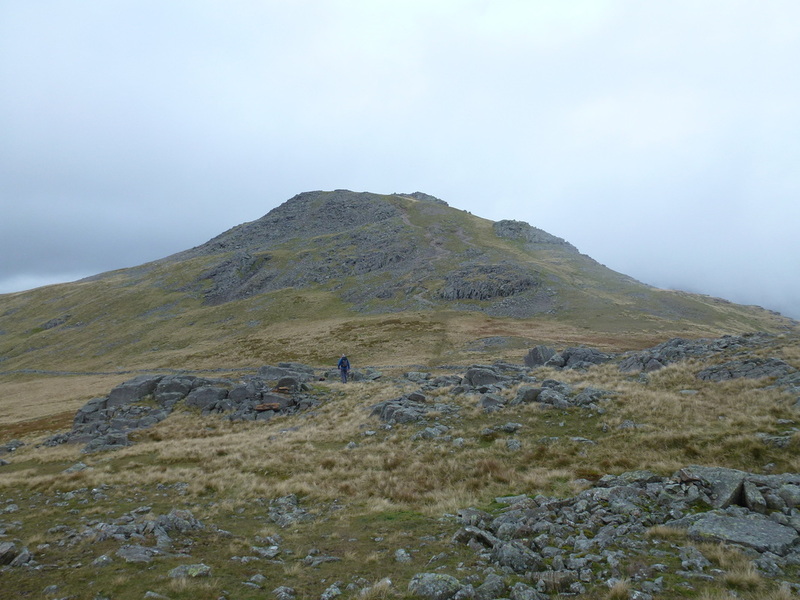 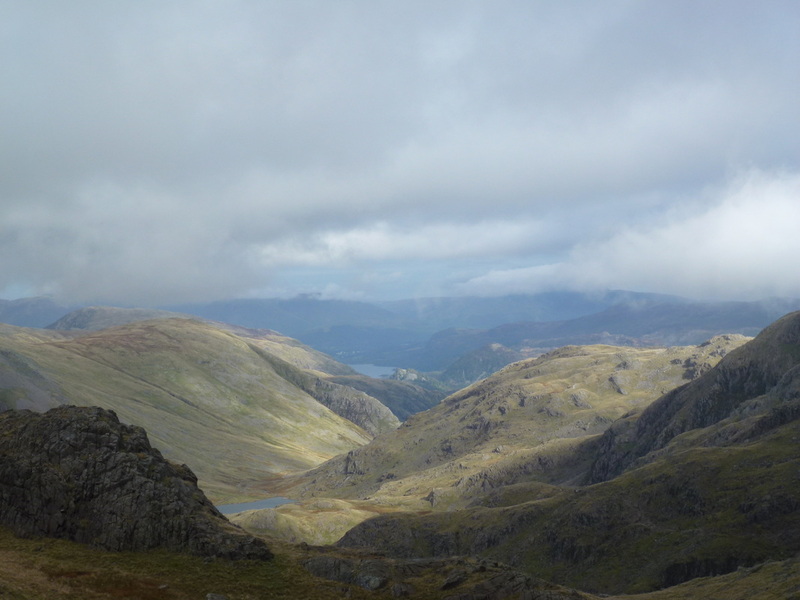 Having lunched on the summit we took a different route down to then rejoin our original path to the col - we did think about carrying on up to Scafell Pike but one look at the hordes of people coming up the Hollow Stones path put that idea straight out of our heads. 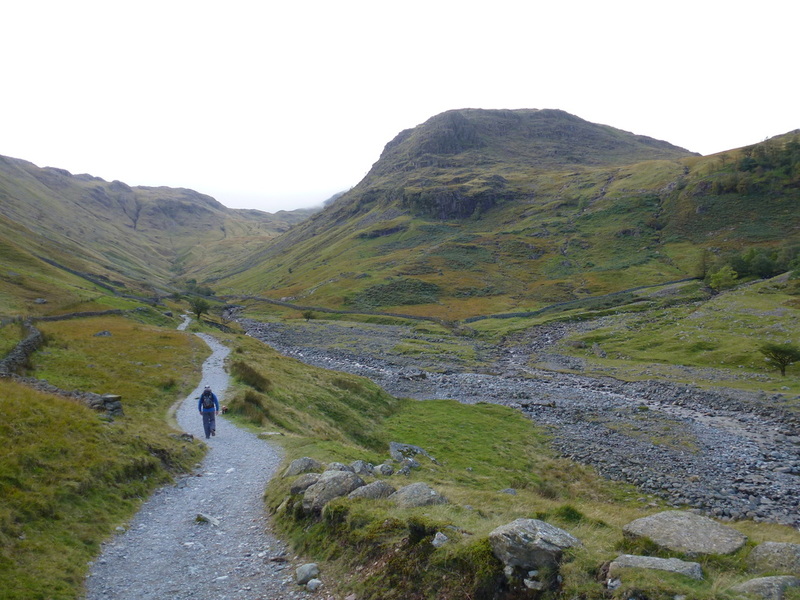 We therefore returned the way we came and once we negotiated the scramble at Stand Crag we were met by a young chap who looked like he was on his way to a tutorial. 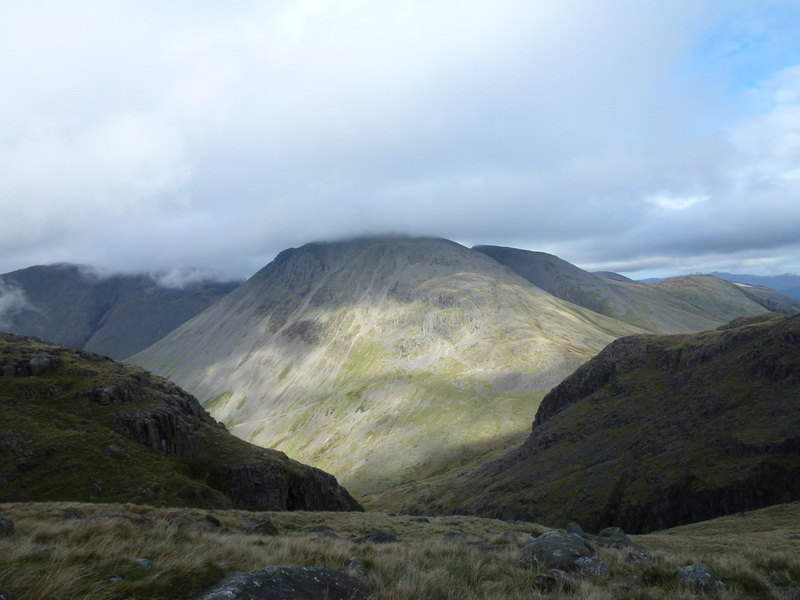 He asked us the way to Grasmere or Keswick from Scafell Pike and we politely told him that both were a long way from here, never mind the Pike. 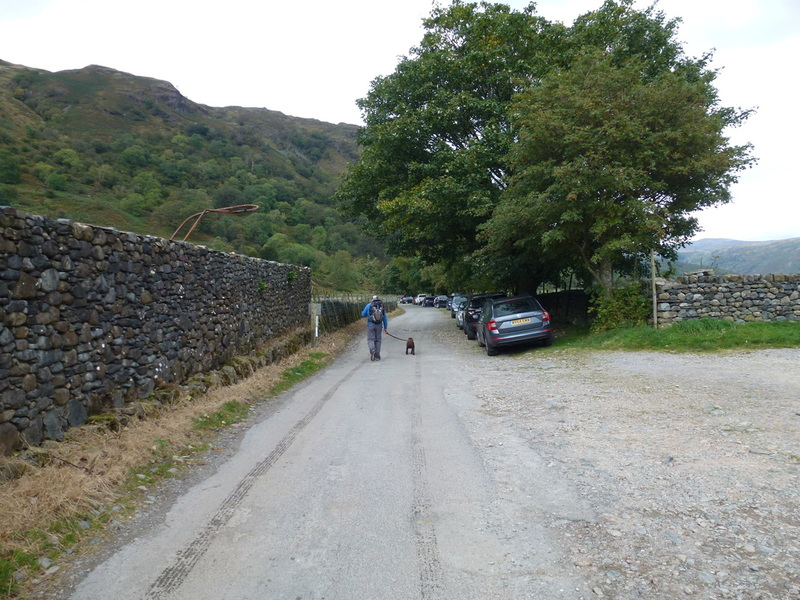 Considering it was 1430 in the afternoon we advised him he would probably be best turning right around and jumping a bus into Keswick from Borrowdale and from there hopping on another bus to Grasmere. 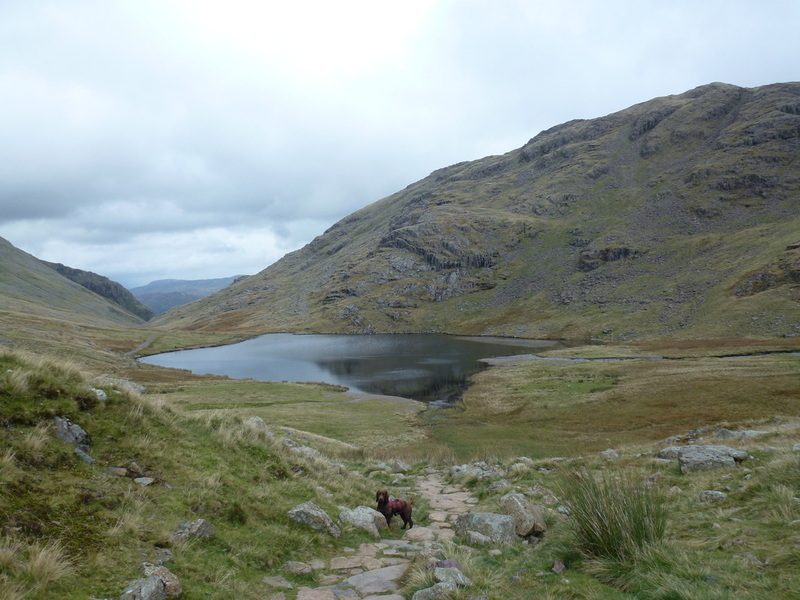 He was a bit taken aback by this and dragged his map out - the one on the back of his Bus Timetable and then proceeded to inform us that it did not look that far to either destination from Scafell Pike. 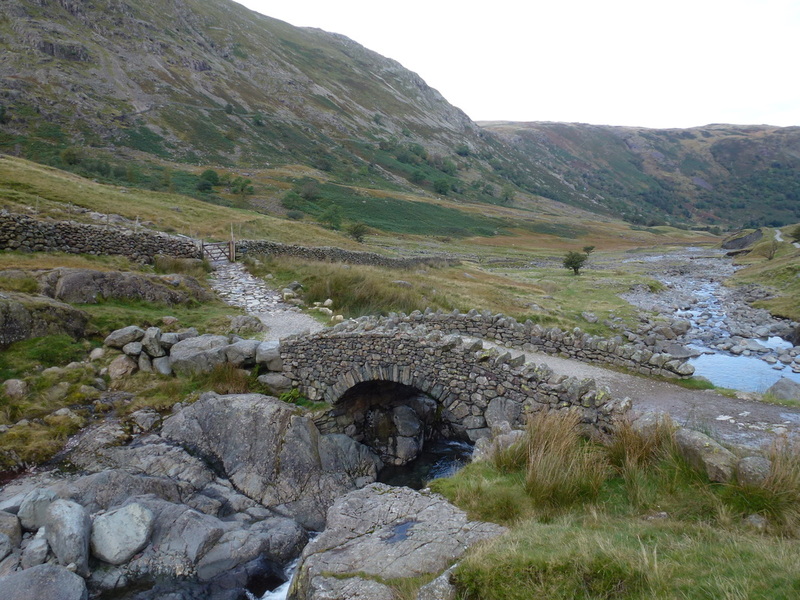 It was at this point we stressed again the problems he may come to face but he pressed on regardless - you can only do so much to help people. 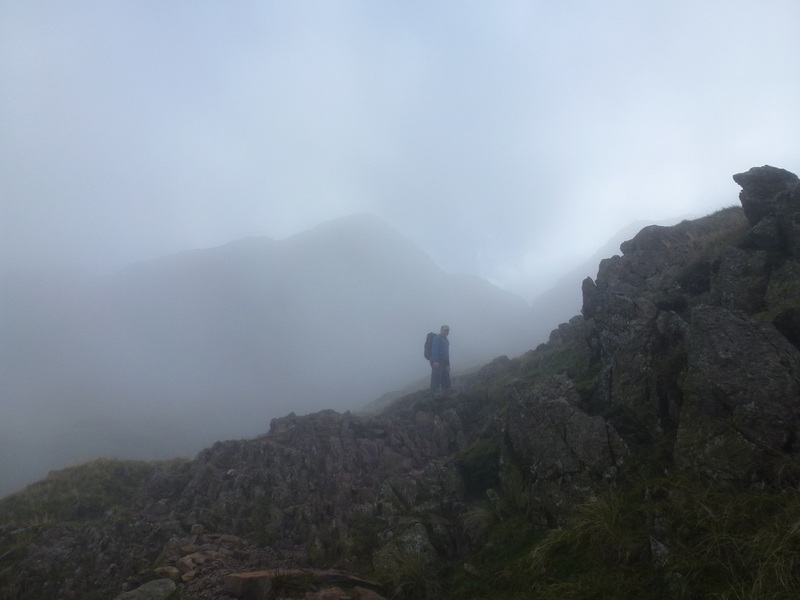 The remainder of the journey passed without incident and whilst we do not normally like doing straight out and back routes, this was still a lovely walk despite the reduced visibility throughout the day. 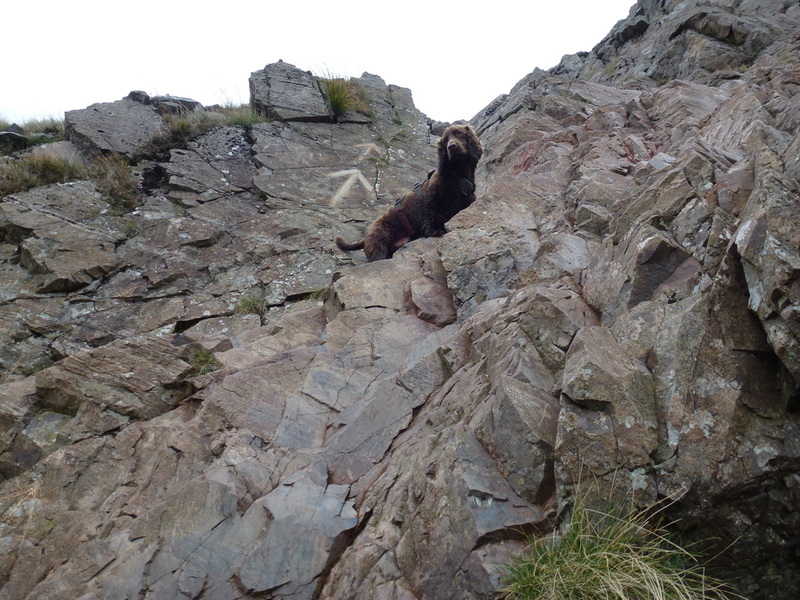 This was a tricky scramble down the rock face but we took our time and all was ok.
Lingmell almost clear now - was our luck about to change?